Been here for 3 days now.. we did only plan to over-night here, but the weather (and side winds) had other plans for us. But there’s been plenty of “given wood” for me to collect, prep and store on the roof for the fire – so being warm is organised for the coming days – which is always good. 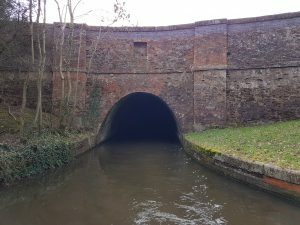 Provisions and the need for a post office are dictating today that we move.. so its on through Crick tunnel and lets hope there’s some mooring spots in Crick for us to pull in at. We were there last year just after we collected the boat, this is where the solar panels were fitted, the roof box was delivered, and Crick post office where I collected the 4G router from.. so were well used to being in this neck of the woods. It always seems to be the case.. You are out cruising in Winter.. no one about with the canal all to yourself.. go into the 1.3km long tunnel.. and then meet a boat coming the other way right in the middle of it!.. Well its two-way traffic, so slide over a bit.. squeeeeze through slowly.. and eventually back out into daylight. 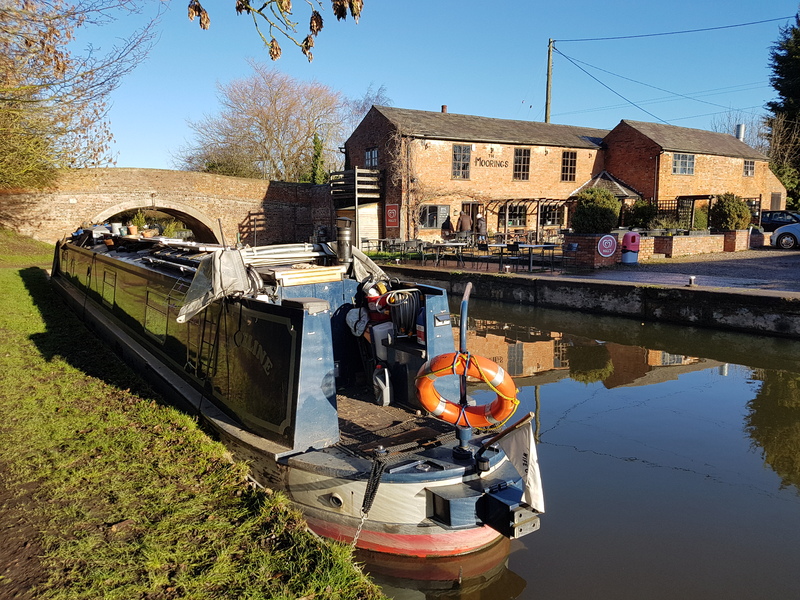 Arrived at the mooring opposite ABNB (the brokers that dealt with the boat sale) and moored up – right opposite a water point – which is handy when we run out in a few days time! Anna’s off to get the supplies in.. I have more work and phone calls to do.. Fires On.. canopy up.. cats out.. dogs watered.. and were settled for the foreseeable.. I do wish these satellites would sort out which one is telling me where I am.. believe me.. I have not been going up and down as the altitude states I have.. perfectly flat canal!